Growing up, I was utterly terrible at videogames; my earliest gaming conquests were achieved with the aid of Game Genie. Recognizing the limits of my gaming abilities (and that my Game Genie cheat booklet didn’t cover all the games in my library), I soon learned to play smarter, not harder—clever strategies helped bridge the gap between my skill and the skill required to succeed. I began examining whether challenges were difficult because I wasn’t good enough, I wasn’t thinking about them the right way, or they weren’t playtested hard enough. Everything I know about good and bad game design has its roots in figuring out how to play games in the first place. Most games I play anymore make me question whether anyone else knows anything about game design. I’m not talking simply about modern titles—this year alone, I’ve played over a dozen games on over a half-dozen systems spanning over 20 years of gaming history, and all but two or three of them deserve a spot on this column. My aim with “The Lost Art of Good Game Design” is to call games out on their lapses in sound judgment and thoughtful planning—things that might go unnoticed if you take the games at face value. As I often say, it’s not what you do so much as why and how you do it that matters, and I think it’s important to take a step back and explore what makes good games bad and bad games worse. Failing that, it’s an opportunity for me to complain to someone other than my wife about the games I’ve been playing. You’re doing her a favor by reading this, I’m sure. When Origin gives away a prequel for free, I’m willing to let cost-effectiveness overrule my inclination to start playing a new series from the first installment that was released. 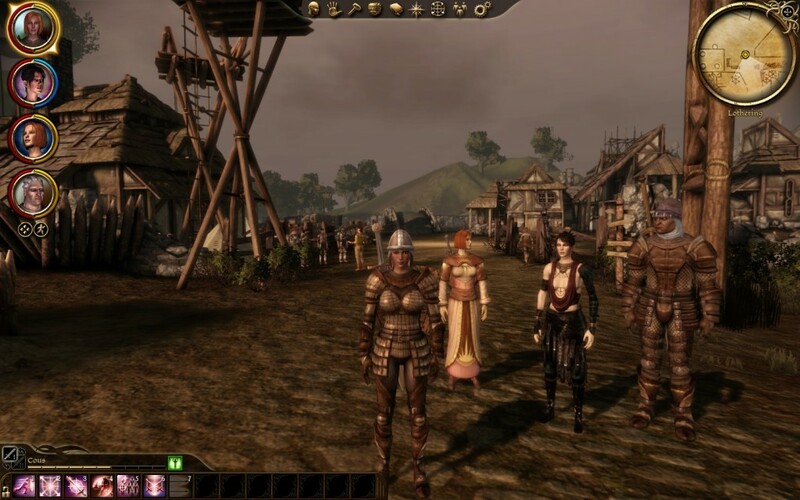 With two Knights of the Old Republic and three Mass Effect games under my belt, plus some experience with Neverwinter Nights and Baldur’s Gate, I wasn’t expecting to be overwhelmed by the intricacies of a new BioWare RPG. I also wasn’t fully committed to learning anything new, in part because I was burned out on the genre by the JRPGs I’d been playing, and in part because the blood-soaked opening cutscenes (not to mention the “Persistent Gore” option on the menu screen) gave me doubts about being able to stomach the game at all. 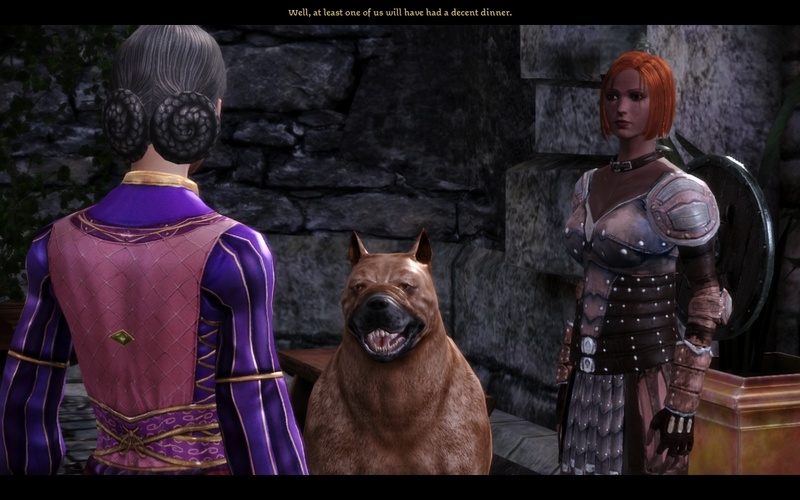 I admit to not taking the game entirely seriously, and you can tell by my lazily customized human noble, named Cous Cousland, and her faithful war hound Pilaf. For the most part, DA:O has a good learning curve. I found the tutorial popups to be helpful and well paced, and there was ample time to get used to making dialogue choices, exploring my surroundings, and engaging my first enemies in combat. (“Giant rats? It’s like the start of every bad adventure tale my grandfather used to tell.”) Accumulating items and equipment was slow, however, for I was a warrior who was easily foiled by locked chests—an annoyance after being able to bash open locked crates in KotOR and bypass locks with Omni-Gel in Mass Effect. BioWare seems to have a problem with maintaining the same basic functionality from one game to the next (see: “Mass Defect 2”); it’s like they forget they have an existing framework to build from and must reinvent the interface every time, haphazardly reorganizing and omitting things along the way. With barely any exposure to inventory management, I was not prepared for my first shopping trip. Let’s ignore for a moment that I’m accustomed to the Dragon Warrior and Final Fantasy style of shopping, where there’s an armor shop carrying four things that are obviously better than what you’re wearing now, and an item shop that sells only the goods that will be relevant to you within the next hour. The first vendor I encountered in was in charge of supplying an entire war camp, and so DA:O went from offering me little more than a nice sword from the armory and a health poultice I picked off a corpse to a STUNNING ARRAY OF WONDROUS GOODS. Everything I could ever need, all under one roof, at prices I couldn’t come close to affording! And I had no idea what any of them were. The pace of the game came crashing to a halt as I read through the descriptions of about 50 items, including trapmaking items (I could make traps? ), poison-crafting items (I could craft poisons? ), and equipment that was only marginally better than what I had equipped, assuming those fatigue penalties (what was fatigue, again?) didn’t make the purchase more of a lateral shift. Oh, and just to be annoying, let’s give the vendor a secret stock of about 30 items that are seemingly comparable to his regular stock but on a separate list altogether. 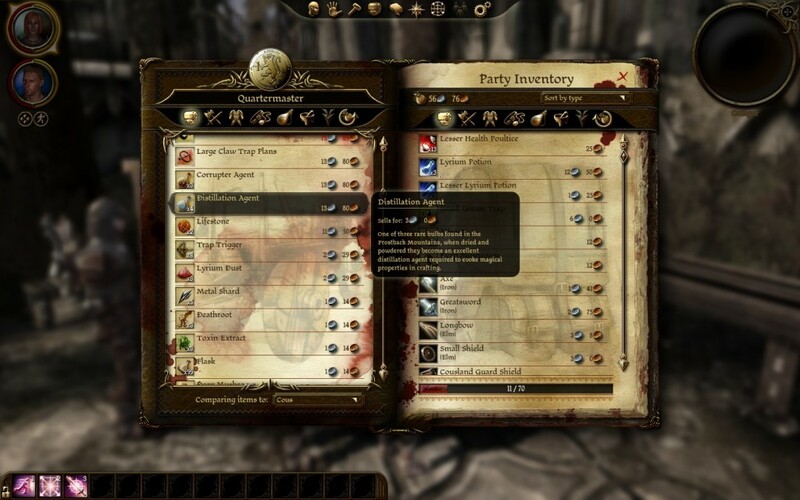 Veteran Dragon Age players might be able to recognize at a glance what everything is, but that’s a lot of information for a newcomer to process, especially when dealing with a tiered currency system (copper/silver/gold) that requires a little extra math to interpret the relative value of each item. Not to mention that non-affordable prices are “conveniently” listed in red, which I can’t readily pick up on thanks to my color blindness. Gray them out, please. Given that this was a war camp, I figured the odds were high that I’d have a limited window of opportunity to shop here before everyone died or went elsewhere. Of course, this was a BioWare game, so this very well could be my base of operations for the rest of the game. This made it difficult to determine whether I should buy anything at all—but my limited funds and inability to discern what was important at this juncture ultimately made the decision for me. At least when I was overloaded by information in Morrowind, I had the freedom to wander off and be irreverent until I was ready to wrap my brain around something as complicated as enchanting my pants. DA:O was already railroading me to the next plot point, and the last thing I wanted was to get stuck somewhere without the proper provisions, be they equipment now or gold later. The next mission supplied me with the gameplay experience I needed to go shopping effectively. By the time I returned to the camp with an idea of what to buy and the money to buy it, I made the mistake of closing the loop on the quest I’d just returned from before visiting my vendor, who promptly disappeared when the plot whisked me off to another quest. It wasn’t until about 7 hours into the game that I had my next opportunity to go shopping, and by that point, the game had effectively trained me to rely on myself and whatever random pickups weren’t locked away in a chest. Moreover, with the sudden and rapid expansion of my character pool beyond the four-person party limit, and with money still being somewhat scarce, the game once again spooked me into not doing any shopping. How long were these companions going to be with me, and how expensive will it be to outfit them? Unless something was outright amazing and equipable on my main character, I saw no need to waste the coin and effort. I’m sure this isn’t how BioWare intended me to play the game, but the progression they laid out for me dissuaded me from taking full advantage of a critical game mechanic. Isn’t upgrading your character supposed to be one of the best parts of the game? Having played Neverwinter Nights *extensively* on PC throughout my high school years (my record was 16 hours straight, it was a problem, I admit it), playing DA:O on console was incredibly intuitive from minute one despite the difference in control set from their PC games. And that was the first console game I had picked up in many, many years. I didn’t feel like the equipment/potions/traps/etc. were any different from your usual D&D or fantasy RPG lineup, if with different names. Oh, Lyrium is mana. Stamina is mana for fighters. Okie dokie. I guess I never really sweated that I couldn’t get the best items exactly when they were available or that I didn’t know exactly how every single mechanic worked as soon as I came across it (like trap making) because I was always able to progress through the plot in an enjoyable, well-paced manner and as long as I wasn’t getting massacred by enemies I was a-OK with what I could afford and make and do. Leveling up and equipping my characters was fun, don’t get me wrong (I was very proud of the badass sword my arcane fighter mage had by the end of the game) but it was not as important as the well-crafted plot. I do agree that the inability to bust open chests was annoying early on (I missed when I could use a chain lightening spell to open all the chests in a room like I did with my druid in Neverwinter), but as soon as you have a rogue in your party you can train them to open locks and then you’re golden. It limits your party options a little, but if you’re not a rogue, having one in your party is useful aside from just having them open things. And they should have caught the red colorblind thing, boo on them. But otherwise I have so little complaints with DA:O as to make it almost a perfect game. Then again, I’m in it for the plot and character development, at which DA:O exceeded expectations. I also think it was one of the most well-designed RPGs in a very very long time… I include in that plot pacing and writing, character design and development, as well as inventory, advancement, and fight mechanics. I did not find any aspect of DA:O’s design lacking in any way that impeded my enjoyment of the game. For players who wanted to immerse themselves completely in the world there was oodles of history and codex entries to read, but those were, in the vast majority of cases, easily ignored if you wanted to just play the game. Honestly, you are the first person I’ve heard say that DA:O was anything but a welcome game-changer (pun intended) for fantasy RPGs that set the bar very high for the future of the genre. There’s a lot that I like about DA:O that is beyond the scope of this article; I’m primarily focusing on the learning curve as it pertains to equipment. The problem is information overload; even if individual concepts (trapmaking, “mana for fighters”, etc.) are intuitive, dumping all of them on the player at once, and burying them under a layer of uncertainty regarding finances and future availability, is bad form. It sends the message that buying equipment is either not all that important, so don’t worry about it too much, or incredibly important, so figure out how you want to build your character ASAP. If I’m settling in for 40-something hours of gameplay, I need to understand up front how careful I need to be with my money, and what abilities are worth investing in. I remember running out of money late in Mass Effect 2 and realizing that gambling for peanuts was the ONLY way to afford everything I needed. That’s an experience I would prefer not to repeat. Eight hours into DA:O, I’m starting to see hints that random encounters when transferring between areas might provide a renewable source of income, and that I might finally have at least one vendor who won’t go away before I can afford more than one thing he’s selling. As someone who plays games for the gameplay, that’s a loooong time to wait for a proper understanding of a fundamental game mechanic. Aw, man. Now I want to play Neverwinter as a Druid just to blow up chests with lightning. I’ve played a lot of Elder Scrolls and KOTOR. I’m thinking about starting up DA:O very soon, as I too got the free origin copy. In fact, I got the recent humble bundle that has Dragon Age 2, Mass Effect 2 (i’ve never played any of them), and a few other titles. I figured for < $5, why not, eh? Anyways, I'm a little burned out on Elder Scrolls, so I thought I might give this a spin. Interesting thoughts on the inventory / shop system. Thinking back to KOTOR, I'm not sure I ever bought anythign from a shop unless I was forced to. I just used loot and never really sold stuff since I wasn't limited by carry weight. I'm assuming that this game series plays more similar to KOTOR, than Elder Scrolls? It’s kind of similar. Tactical positioning of your characters is very important in the game. But it doesn’t use a d20 system like KOTOR did so your stats are a little more reliable. I wouldn’t say anything from shops is even necessary in DA: O. You acquire so much random loot that it really doesn’t even matter. I will say definitely have fun with it. A lot of the classes are insanely broken. And if you decide to go onto Dragon Age 2 don’t expect it to be a similar experience. That way, you won’t be disappointed. OK, I ended up going Elven Mage as my origin. I’m having fun so far. But I agree with Nathaniel, my experience with my first shop keeper was… interesting. I find it curious that with all the tutorial popups, they have yet to explain that the bar at the bottom of the inventory is your carry limit, but items do not have weight, they all just count as “1”. And yeah, the Quartermaster’s list of “hush hush items”, was just another set of weapons, and armor. I guess it had some maybe taboo poisons and stuff, which is more what I was expected, rather than a tier of awesome looking gear. Also, teh system didn’t explain the gold/silver/bronze money system. Maybe my digital copy has a digital manual? Also, why can’t I view the monetary value of an item only when I’m at a shopkeeper. as I am very new to the attributes / and overall system, it would be nice if I knew the overall value of an item. Like, I am uncertain if a staff of +2 Spellpower is better than a staff of +1 magic.